The Indoor Ant Kit includes all the products you need for professional treatment of most ants commonly found indoors. This kit uses the convenience of bait plate stations and the attractiveness of two unique baits to fill the dietary needs of most household ants. Ants looking for sweets will consume Advion Ant Gel, and ants seeking protein will consume Maxforce Complete Granular Bait. Both baits have slow acting active ingredients that allow ants to continue their routine activities for some time before succumbing to the effects, so ants have time to transfer active ingredients throughout the colony. Because ants continue to return with food, the colony does not know there is a problem until after the bait has already spread. Results are seen in as little as 6 hours, and colonies are usually gone within a few days (colony size will determine length of treatment). This kit also contains Temprid Ready Spray, a ready-to-use version of the popular Temprid SC that contains two active ingredients for both initial knockdown and residual non-repellent activity that pairs perfectly with baiting because of its similar transfer effect. Temprid Ready Spray continues to work long after it is dry to help prevent future infestations, too. As with all of our Pest Control Kits, we recommend using an Integrated Pest Management approach to ant control. It is crucial to practice good sanitation by eliminating competing food and water sources, and to eliminate harborage and entrance points to keep ants from entering the structure. For residents of NY, or CT, see our California / New York Indoor Ant Control Kit. 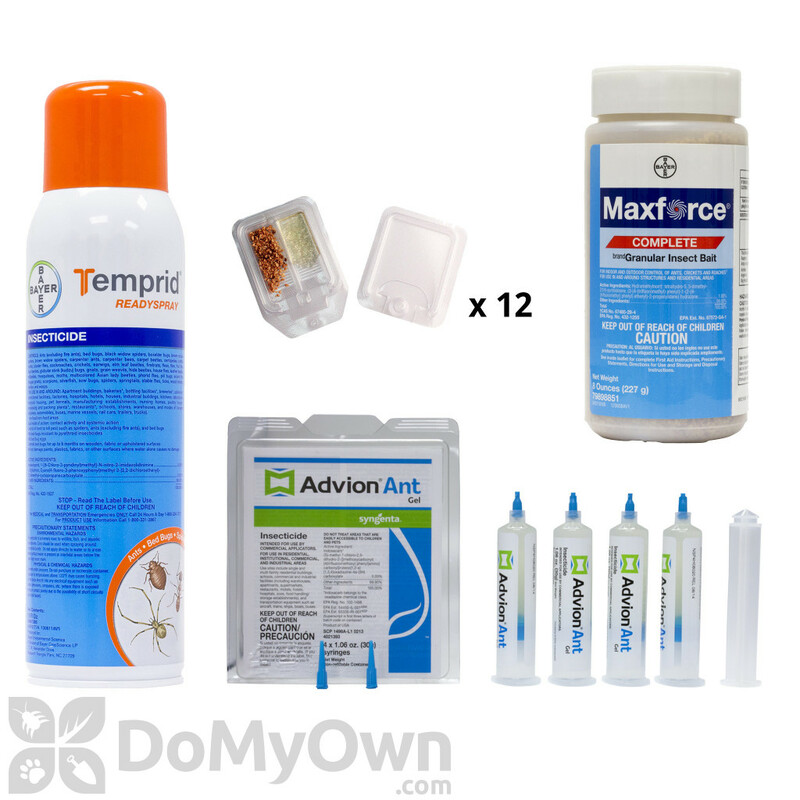 See all of our Ant Control Kits here. Before applying any insecticides, it is important to inspect and to prepare the treatment area. Practice good sanitation by eliminating food and water sources that may compete with the baits you are about to apply. Also find ways to seal up and eliminate access points into the structure. These steps will help not only to treat an existing infestation, but also to prevent future problems. Once you have identified the hot spots where ants are entering or trailing indoors, you are ready to use the products in your Indoor Ant Kit. *Handle bait stations with clean, dry hands or wear gloves. Avoid handling bait with bare hands as this may make baits less palatable. *Your kit includes a set of 12 bait station bases, 12 lids, and 12 glue dots. Pull apart the stacks to separate the components. Each base is a tray with two ridged channels so that you can use two different baits in each bait plate station. *Be sure to store bait in a cool, dry place with the lid securely closed. *To apply the Advion Ant Bait Gel, first gently unscrew the solid black tip of the tube you would like to use. Replace this tip with one of the clear, reusable tips included with your kit. Use either a bait gun or the included plastic plunger to gently expel the gel from the tube, similar to using a syringe. (You may need to pull back gently on the plunger to prevent over-application.) Place a spot of bait about the size of a pea in the other side of each bait plate stations you plan to use. *When you are done applying the Advion Ant Bait Gel, replace the clear plastic tip with the black solid tip to store bait. *After you have filled your bait plate station trays, snap a lid onto each one by lining up the U-shaped tab and the round tab with the corresponding parts in the tray. Gently press the edges of the lid until it is firmly snapped into the tray, being careful not to tilt the trays, which may cause granule bait to spill. It is not necessary to remove the perforated tab from the bait plate station lids. In kitchen cabinets and on counter tops. Behind, next to, and under the stove. Around pipes, cords, and cables that come out of the wall. Behind and under bathroom fixtures. Around the medicine cabinet and vanity. *You should check the bait placements once a week and replenish as needed until ant activity has ceased. Be sure to continue reapplying bait as long as the ants accept it! *Store baits in a dry, temperate area, out of direct sunlight. Baits are best used within a year of opening. *Bait stations may be wiped clean and washed with warm water for reuse later. Do not use fragrant cleaners, as this may make future bait applications unattractive. *Temprid Ready Spray is a ready-to-use spray that has two active ingredients to provide both quick knockdown and lasting residual control. The second non-repellent active ingredient will have effects similar to those of your ant baits. Although this may take a little more time to start killing colonies, it is a great companion and backup for when ants may not be actively foraging for food. Temprid also helps to keep new colonies of ants and many other pests from invading the structure. *Always shake Temprid Ready Spray well before use. *Temprid Ready Spray uses bag-on-valve technology for no VOC exposure, 360 degree application, reduced waste, and a powerful 10-12 foot reach. Hold the can 12 to 18 inches from the target surface. *Apply Temprid Ready Spray to cracks and crevices where ants are likely to enter the structure or to trail, such as around window frames and door frames, where pipes and other utilities enter the structure, in corners, under appliances, and in any other spots where ants may have access into the structure. Avoid spraying areas where baits are or will be placed. *Keep other people and pets out of the treatment area until the spray has dried. *Temprid Ready Spray is water-based and will not damage or stain surfaces where water alone causes no damage. *Do not spray Temprid Ready Spray or other insecticides directly on top of bait placements or in the same spot where you plan to apply baits. *Temprid Ready Spray may be reapplied if needed, but wait at least 7 to 10 Days between applications. I had tried everything!!!! Didn't know that my ants were protein lovers! I put out the traps 12/31/15 and in no time had a mat of ants continuously recycling carrying and emptying 3 filled trays in about 5 hours. Then it started to get noticeably less and when I woke up the next day none!!!! Three weeks later no more ants at all. This had been an awful 5 weeks before this. simply awesome!! A bit pricey, but what's the price of not having tiny ants crawling all over everything? We deployed per the instructions, dry bait, wet bait, and barrier spray. The 2 month aggravation was gone in 7 days. We had ants in the house; not a ton of ants but no matter what room you were in, it seems like there was an ant on the floor or wall or countertop, both upstairs and downstairs. I wondered if this product had the range to defeat our ant problem and it didn't disappoint. In 2 weeks time, we are ant free. We've even challenged the kids to try to locate an ant in the house... they can't find one! Great product (I felt OK with the product with my dog around as well... he was uninterested). After trying box store sprays and remedies, I turned to do my own pest control after seeing the ants in my house colonizing (flying ants). After 3 days of using this kit, the ants are gone. I could literally watch them carry the granules back toward their colony! Just buy this kit before trying anything else, and you will save yourself time, frustration, and money! I bought this kit last year. At that time, it did not include the Phantom product. It was simply the Maxforce and Advance with the bait plates. This combo is amazingly effective. You simply locate and active trail the ants have created in your home and set a loaded plate near that trail. Within minutes, you will see dozens, if not hundreds, of ants feeding on both products in the plate. 24 hours later, there are no signs of ants anywhere in the home. The best part is that I have treated my house several times over the past year and I still have 50% of both the granules and the gel. This kit is a long-term solution. When I run out, I will certainly buy this kit again. It is far more effective than big box store solutions. Will the Indoor Ant Kit help keep out small black ants this summer? I would leave a simple dinner plate in the sink and the next morning black ants. No matter how often I cleaned, they came back. I used that Home Depot Home Defense Product and it did not work. We would recommend using Termidor SC outdoors around the perimeter of your home. This will ensure that the ants do not enter your home. This treatment will last for six months outdoors. Termidor SC is strictly an outdoor treatment. Indoors, we would recommend using the Indoor Ant Kit. It comes with a sugar and a protein for ants to consume and take back to the colony. This can be used in places around your kitchen and/or rooms where you have seen activity. This kit also includes Phantom Aerosol, a non-repellent spray for use indoors. Which product is more effective on Pharaoh ants, Advion gel or Maxforce gel? They are in the bathroom , small holes in plaster board between where ceiling and wall meets on outside wall. Both products will work very efficiently for pharaoh ants and are labeled for them. For pharoah ants, we generally recommend our Indoor Ant Kit. It comes with everything you will need to do a complete treatment. Also, please check out our Ant Guide for tips on how to treat and prevent ants. *To apply the Maxforce FC Ant Bait Gel, first gently unscrew the solid black tip of the tube you would like to use. Replace this tip with one of the clear, reusable tips included with your kit. Use either a bait gun or the included plastic plunger to gently expel the gel from the tube, similar to using a syringe. (You may need to pull back gently on the plunger to prevent over-application.) Place a spot of bait about the size of a pea in the other side of each bait plate stations you plan to use. *When you are done applying the Maxforce FC Ant Bait Gel, replace the clear plastic tip with the black solid tip to store bait. *Phantom aerosol is a non-repellent ant spray that will have effects similar to those of your ant baits. Although this will take a little more time to start killing the colony, it is a great companion and backup for when ants may not be actively foraging for food. *Apply Phantom to cracks and crevices where ants are likely to enter the structure or to trail, such as around window frames and door frames, where pipes and other utilities enter the structure, in corners, under appliances, and in any other spots where ants may have access into the structure. *Do not spray Phantom or other insecticides directly on top of bait placements. *Phantom may be reapplied if needed, but wait at least 4 weeks between applications. Can I use the Indoor Ant Kit to get rid of red ants in the bathroom? Before applying any products, it is important to inspect and to prepare the treatment area. Practice good sanitation by eliminating food and water sources that may compete with the baits you are about to apply. Also find ways to seal up and eliminate access points into the structure. These steps will help not only to treat an existing infestation, but also to prevent future problems. Once you have identified the hot spots where ants are entering or trailing indoors, you are ready to use the products in your Indoor Ant Kit. Is the Indoor Ant Kt safe for use around children and pets? Yes, the Indoor Ant Kit is perfectly safe to use around children and pets. You would just need to have then out of the area while spraying the Phantom II Aerosol, and until that product dries, Also with the bait products you would need to keep them out of reach of both the children and pets. This kit does come with bait plait stations to be able to apply both baits within the kit safetly. Will the Indoor Ant Kit help kill tiny ants in my kitchen? I suddenly have tiny ants in my kitchen drawers and on the countertops. Our Indoor Ant Kit would help cover the ants dietary needs of sugar and protein, as well as an insecticide you can spray around baseboards, cracks, crevices and any other entry points including under the kitchen sink. We also have a great Ant Treatment Guide that can help guide you to effectively get rid of these ants.